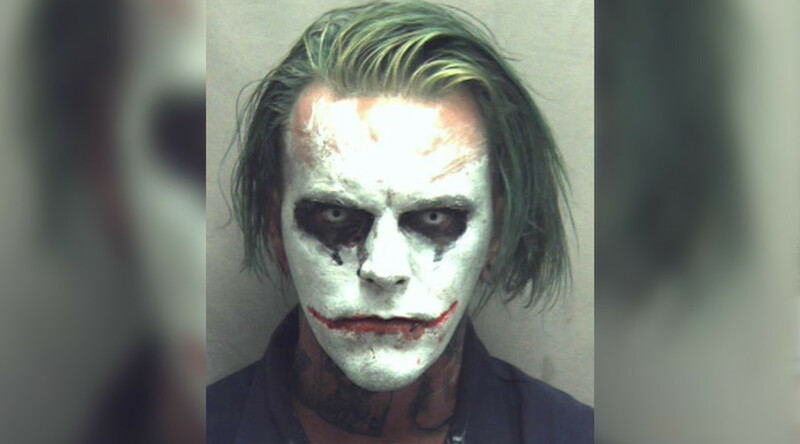 Police in Virginia have arrested a man after receiving several complaints about a suspicious-looking, caped man resembling ‘the Joker,’ who was wielding a sword while walking the city streets. Batman was apparently indisposed at the time, and instead, the Winchester Police Department was forced to spring into action. Jeremy Putman, 31, was arrested Friday and is being held on $2,000 bond at the Northwestern Regional Adult Detention Center, according to the police. Putman faces up to five years in jail for the Class 6 Felony charge - though he may just be a victim of his own fashion sense. State law aimed at combating extremist groups such as the Ku Klux Klan states that, “It shall be unlawful for any person over 16 years of age, with the intent to conceal his identity, wear any mask, hood, or other device, whereby a substantial portion of the face is hidden or covered, so as to conceal the identity of the wearer,”according to Virginia Code 18.2-422, as cited by ABC News. The police said they received similar reports throughout the week, but do not believe there are additional suspects. They also reminded local residents of the seriousness of the crime and highlighted that the severity of the potential penalty is no laughing matter.